A 68 y/o female with a history of COPD presents c/o SOB. Temp – 98, Pulse – 120, Respirations – 28, BP 160/88, O2 sat 84% on room air and goes up to 92% on nasal cannula. Lungs reveal wheezes b/l but moving good air and minimal accessory muscle use. The rhythm requires no specific management. The underlying COPD exacerbation should be treated. The EKG demonstrates a tachycardia with a narrow QRS complex, which is irregular. P waves are present but the P wave morphologies and the PR intervals are different from each other. This is consistent with MAT. To diagnose MAT, there must be at least 3 morphologically different P waves on the EKG rhythm strip. Often you will see the same P wave for several beats followed by a different P wave for several beats and then another different P waves for several beats. MAT is commonly found in patients with lung disease such as COPD. Typically, the rhythm itself requires no treatment. Treatment is aimed at the underlying respiratory problem. If the rhythm persists despite treating the respiratory problem and is making the patient symptomatic, it can be treated with magnesium (2g IV). 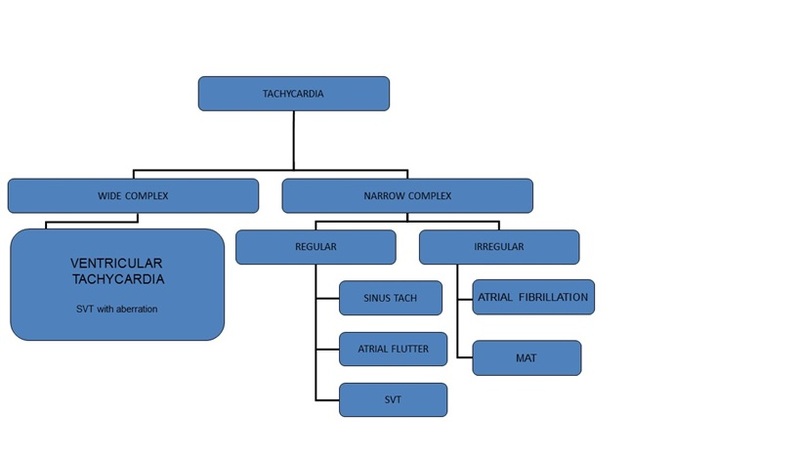 The following algorithm is helpful in diagnosing tachyarrhythmias.